Colorful sunsets over the sparkling waters of the Gulf of Mexico. White sand beaches filled with shells and sun worshipers -- the perfect itinerary for a relaxing vacation....or if your idea of perfection is a more active day, enjoy fishing, or a round or two of golf. For the more adventurous...kayak through mangrove lined backwaters filled with birds and wildlife. We're showcasing all that Marco Island Florida has to offer right here. Make this web site your springboard for jumping into the Cities and Lifestyles that make up our paradise! Mackle Community Park - Walking, biking, playground, picnic area, soccer, bocce courts, shuffleboard, indoor games room, spray water park. Rookery Bay Environmental Learning Center - Located on over 110,000 acres, The Environmental Learning Center is a 16,500 square-foot facility with four research laboratories, classrooms and 140-seat auditorium, and two story visitors center. The visitor center offers a variety of hands-on experiences, including 2,300-gallon aquarium and interactive exhibits addressing research and stewardship efforts ongoing within the Reserve, as well as a nature store, gallery and picnic area. Marco Island Boat Tours and Boat Assisted Kayak Eco Tours - Marco Island Boat Tours is an educational tour operator working in Florida's 10,000 Islands National Wildlife Refuge, Everglades National Park and the surrounding protected areas. All guides are formally trained Florida Master Naturalists, Environmental Educators and Full-Time Outdoor Leaders. Power Boat Tours - Marco Island - Goodland and The 10,000 Islands. Ole Indian trading post and museum. Everglades Island Airboat Tours - and Totch's Island Tours - the only tour in Everglades city that gives you a choice of back country or open water to Totch's Island. Dolphin Explorer Join the Crew of the Dolphin Explorer on the only Bottlenose Dolphin Study in SW Florida! We See Dolphin Every Day! 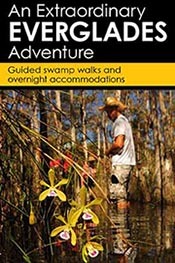 Everglades Backcountry Experience - Fishing and backcountry excursions with Capt. Rodney Raffield. Enjoy the beauty and wildlife of the Everglades on a unique fishing trip through the 10,000 Islands and Everglades. Rookery Bay Research Reserve’s newest research vessel, the R/V Dolphin, gives children of all ages the opportunity explore the estuary. You can learn about estuarine organisms by categorizing animals found in a trawl net, measuring and tagging sharks, viewing underwater scenes, and much more. A second exhibit features live displays of plankton, local drifters of the estuary which include tiny, floating plants and animals that form the base of the food web. There is also an interactive touch tank that is part of this live exhibit.